Related Article: AV Blocks, Second Degree AV Block, Complete AV Block. First degree AV Block is the mildest Atrioventricular Block. 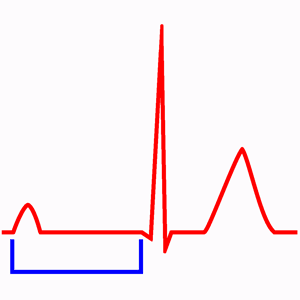 In this AV block there is a delay in the conduction of the electrical impulse within the AV Node or the His-Purjinke system, causing a PR interval greater than 200 ms 1. In First Degree AV block, the conduction disorder is usually produced in the Atrioventricular Node, and more rarely, in the His-Purkinje system (see Cardiac Conduction System). First degree AV Block with prolonged PR interval (0.52 sec). The electrocardiogram is characterized by P waves followed by normal QRS complexes, but with prolonged PR interval of 0.20 sec or higher (1 large square). In First degree AV Block the stimulus is always conducted to the ventricles, so, all P waves are followed by a QRS (unlike other AV blocks). In some patients, the PR interval is so prolonged, that the P wave appears included in the previous QRS or even before it. Prolonged PR interval, > 0.20 seconds (1 large square). All P waves are followed by a QRS complex. Normal QRS morphology, if no other alteration is present. The first degree Atrioventricular Block is usually asymptomatic and do not produce changes in heart function 2. Antiarrhythmic drugs can cause first degree AV block, if so, should assess the risk/benefit of continuing treatment. It also appears in hyperkalemia. When there is a markedly prolonged (> 0.3 sec) PR interval, atrioventricular dyssynchrony may occur and may appear symptoms, especially during exercise. The first degree Atrioventricular Block does not require pacemaker implantation. Although patients with very prolonged PR interval with symptoms during exercise could need the implantation of a DDD pacemaker to ensure atrioventricular synchrony. The finding of a First degree AV Block with a Bifascicular Block can mean important Conduction System disease and, if it is accompanied by symptoms, is usually an indication of permanent pacemaker implantation. 3. Vogler J, Breithardt G, Eckardt L. Bradyarrhythmias and Conduction Blocks. Rev Esp Cardiol. 2012;65(7):656–667.